Usual interstitial pneumonia seen on CT scan. Honeycomb fibrosis is seen at the bases of both lungs. 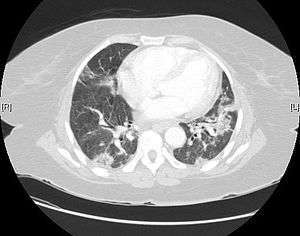 Usual interstitial pneumonia (UIP) is a form of lung disease characterized by progressive scarring of both lungs. The scarring (fibrosis) involves the supporting framework (interstitium) of the lung. UIP is thus classified as a form of interstitial lung disease. The term "usual" refers to the fact that UIP is the most common form of interstitial fibrosis. "Pneumonia" indicates "lung abnormality", which includes fibrosis and inflammation. A term previously used for UIP in the British literature is cryptogenic fibrosing alveolitis, a term that has fallen out of favor since the basic underlying pathology is now thought to be fibrosis, not inflammation. The cause of the scarring in UIP may be known (less commonly) or unknown (more commonly). Since the medical term for conditions of unknown cause is "idiopathic", the clinical term for UIP of unknown cause is idiopathic pulmonary fibrosis (IPF). Examples of known causes of UIP include systemic sclerosis/scleroderma, rheumatoid arthritis, asbestosis, and prolonged use of medications such as nitrofurantoin or amiodarone. UIP may be diagnosed by a radiologist using computed tomography (CT) scan of the chest, or by a pathologist using tissue obtained by a lung biopsy. Radiologically, the main feature required for a confident diagnosis of UIP is honeycomb change in the periphery and the lower portions (bases) of the lungs. The histologic hallmarks of UIP, as seen in lung tissue under a microscope by a pathologist, are interstitial fibrosis in a "patchwork pattern", honeycomb change and fibroblast foci (see images below). Appearance of usual interstitial pneumonia (UIP) in a surgical lung biopsy at low magnification. The tissue is stained with hematoxylin (purple dye) and eosin (pink dye) to make it visible. The pink areas in this picture represent lung fibrosis (collagen stains pink). Note the "patchwork" (quilt-like) pattern of the fibrosis. Appearance of honeycomb change in a surgical lung biopsy at low magnification. The dilated spaces seen here are filled with mucin. Hematoxylin-eosin stain, low magnification. A fibroblast focus in a surgical lung biopsy of UIP. Hematoxylin-eosin stain, high magnification. The white space to the left is an airspace. The pale area to the right is a fibroblast focus. 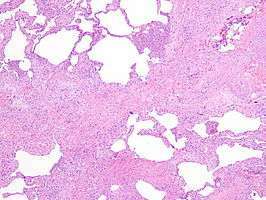 It is an area of active fibroblast proliferation within the interstitium of the lung. UIP, as a term, first appeared in the pathology literature. It was coined by Averill Abraham Liebow. ↑ Travis WD, King TE, Bateman ED, et al. (2002). "ATS/ERS international multidisciplinary consensus classification of idiopathic interstitial pneumonias. General principles and recommendations.". American Journal of Respiratory and Critical Care Medicine. 165 (5): 277–304. doi:10.1164/ajrccm.165.2.ats01. PMID 11790668. ↑ Sumikawa H, et al. (2008). "Computed tomography findings in pathological usual interstitial pneumonia: relationship to survival.". American Journal of Respiratory and Critical Care Medicine. 177 (4): 433–439. doi:10.1164/rccm.200611-1696OC. PMID 17975197. ↑ Katzenstein AL, Mukhopadhyay S, Myers JL (2008). "Diagnosis of usual interstitial pneumonia and distinction from other fibrosing interstitial lung diseases.". Human Pathology. 39 (9): 1275–1294. doi:10.1016/j.humpath.2008.05.009. PMID 18706349. ↑ Leslie, Kevin O; Wick, Mark R. (2005). Practical pulmonary pathology: a diagnostic approach. Edinburgh: Churchill Livingstone. ISBN 0-443-06631-0. OCLC 156861539. ↑ Averill Abraham Liebow at Who Named It?